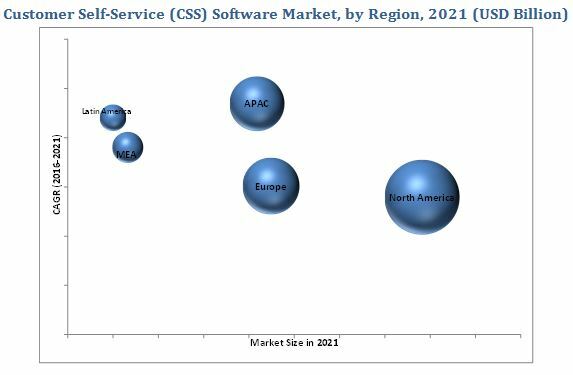 [155 Pages Report] The customer self-service software market is estimated to grow from USD 4.33 Billion in 2016 to USD 9.38 Billion by 2021, at a Compound Annual Growth Rate (CAGR) of 16.7% during the forecast period. The customer self-service software report aims at estimating the market size and future growth potential of the market across different segments, such as solutions, services, deployment types, verticals, and regions. The primary objectives of the report includes providing a detailed analysis of the major factors influencing the growth of this market (drivers, restraints, opportunities, industry specific challenges, and burning issues) and analyzing the opportunities in the market for stakeholders and details of a competitive landscape for market leaders. The customer self-service software ecosystem comprises companies such as Microsoft Corporation, Nuance Communications, Inc., Oracle Corporation, SAP SE, Salesforce.com, Inc., Aspect Software, Avaya, Inc., BMC Software, Verint Systems, Inc., and Zendesk, Inc. Further, the solutions developed by these companies are used by education, healthcare and life sciences, BFSI, retail, government and public, manufacturing, telecom and IT, transportation and logistics sectors. MarketsandMarkets forecasts the customer self-service software market size to grow from USD 4.33 Billion in 2016 to USD 9.38 Billion by 2021, at a Compound Annual Growth Rate (CAGR) of 16.7%. Enhancing the customer service through self-service tools empowers companies to increase customer satisfaction and loyalty, and increasing availability of various customer service touch points are the major driving factors for the growth of this market. The customer self-service software market is broadly classified by vertical into BFSI; manufacturing; retail and e-commerce; education; media and entertainment; IT and telecommunication; healthcare and life sciences; transportation and logistics; utilities; government and public, and others. The BFSI sector commands the major market share; Healthcare and life science is expected to be the fastest-growing vertical in this market as the institutions are increasingly deploying self-service apps through which the patients can perform routine healthcare-related tasks such as scheduling appointments, filling out or updating forms, and bill payments. Web self-service solution is expected to dominate the solution segment in the customer self-service software market as it is used as a digital support mechanism by many organizations, which enables the customers and employees in the organization to self-assist themselves by providing access to information and perform routine tasks over the internet. Social media and community self-service is expected to be the fastest-growing solution in this market, as companies are rapidly switching to the social media by forming peer-to-peer support communities and discussion forums for reducing their customer support costs. The customer self-service software market is segmented across five regions, namely, North America, Asia-Pacific (APAC), Europe, Middle East and Africa (MEA), and Latin America. North America is expected to account for the largest share of the overall CSS software market in 2016, owing to factors such as increasing penetration of mobile and web self-service solutions among customers and the presence of major CSS software vendors in the U.S.
APAC is expected to have the highest growth rate during the forecast period as organizations in this region are looking to adapt CSS solutions to meet the demand of dynamic customer base as well as SMEs are also acknowledging the importance of CSS solutions and are receptive towards considering dedicated self-care application. Hesitation among organization’s employee to adapt new self-service technologies and less awareness among customers is the major restraining factor in this market. However, integration of artificial intelligence (AI) & business Intelligence (BI), and big data with CSS technologies to understand consumer behavior is expected to provide good opportunities for the growth of the CSS software market. On a strategic front, many companies are utilizing different growth strategies, such as mergers & acquisitions, partnerships & collaborations, and product developments to increase their share in the market. Some of the major technology vendors include Nuance Communications (U.S.), SAP SE (Germany), Salesforce.com, Inc. (U.S.), Oracle Corporation (U.S.) and Microsoft Corporation (U.S.). For instance, Nuance Communications, Inc. acquired TouchCommerce, a leader in digital customer service and engagement solutions for USD 215 million. This acquisition will accelerate Nuance’s Enterprise business and expand its customer care solutions with new digital self-service offerings, such as live chat, customer analytics and personalization solutions. SAP partnered with Accenture to launch a multi-channel customer engagement platform for utilities by integrating the SAP S/4HANA utilities solution with SAP Hybris cloud for customer and SAP multichannel foundation. This platform will help the utility companies to enhance the experience of their customers through multi-channels, and various self-service tools.